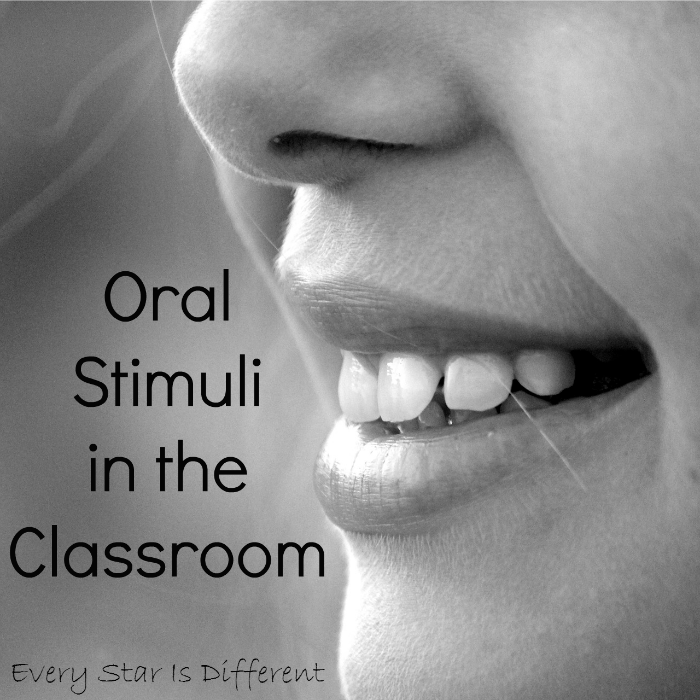 Oral stimuli in the classroom is not something many people think about, but it can have a huge affect on students in the classroom for better or for worse. 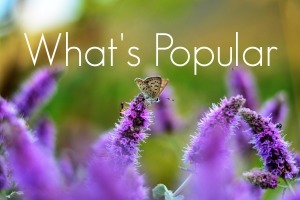 The easiest way I can think of to introduce this topic is to share my own experiences. My experiences have been very different with each of my children. When Dinomite was a baby he refused to nurse at 1 week old. It was a constant battle to get him to take a bottle. When he was old enough to try solids, he refused. No matter what I tried, nothing seemed to work. The only thing we could get him to eat most days were freeze dried fruits offered in the baby section of the grocery store. Dinomite wouldn't sit at the table. We literally had to hide his food in his toys, in hopes that he would find them and put them in his mouth. At about 18 months the doctor expressed concern about his weight and mentioned a possibility of needing to take some action to get him to gain weight. I told the doctor he could try, by all means, but I could guarantee Dinomite wouldn't take the drink or food he wanted him to. Luckily over time Dinomite did start to gain weight, but he still has extreme sensitivities to foods. Dinomite will not eat any vegetables. The only fruits he will eat is apples. The apples have to be cut just right with the peel off. He will eat vanilla yogurt, but no other flavors. For most of his life he's lived off of chicken tenders, peanut butter and jelly sandwiches, and cereal. Now and then he'll go for a pizza, ice cream, cookies, dough nut, cake, bagel, or cracker, but it all depends on what kind. The pizza must look just right. The ice cream has to be plain vanilla or chocolate without anything in it. The dough nuts can not have sprinkles or be messy. The bagels need to be plain with cinnamon cream cheese. Crackers can not be seasoned or colored with any flavors or dyes. Luckily, Dinomite likes drinks. He'll drink juices, lemonade, fruit punch, milk, shakes, etc. This is how I manage to get in some of his fruits and vegetables. I was worried for a long time about Dinomite's nutrition. 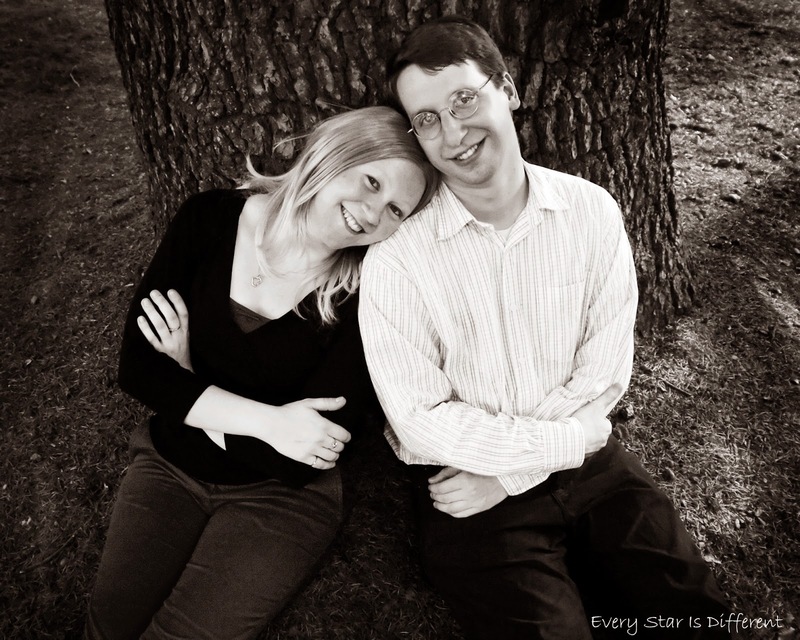 We were asked to participate in a nutritional study offered by The Autism Treatment Network. It turned out, Dinomite was only deficient in Vitamin B, which was easily remedied. 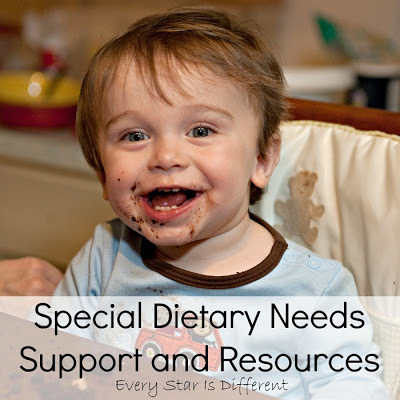 The gluten free/casein diet is very popular with some with autism, but for him, it was not recommended, as it would eliminate almost all foods he was willing to eat. I have learned over time Dinomite will only eat foods that are white, beige, or brown with minimal texture, unless they have a fruity flavor to them. When fruity flavors are involved, he enjoys a rainbow of colors. He loves Starbursts, Skittles, jelly beans etc. When he did attend preschool, we had to send a lunch box for him for snack time because he would not eat what the other kiddos were eating. If there are food related activities in our classroom, I have to pay particular attention to Dinomite's oral sensory needs. If the foods I have chosen to include are too much for him, he will not participate. 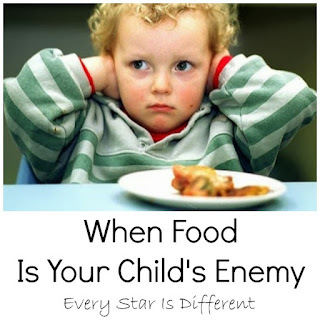 However, if they are similar to foods he will eat, it is amazing to watch him try new things. Removing him from the meal time setting does wonders. At the same time, as complicated as it may seem, Dinomite always learns and works best when chewing. We've found that having gum on hand is a must. It helps him concentrate, relieve anxieties, and actually helps him complete his work. Of course the gum has to be fruit flavored. Lol. Bulldozer craved oral input as a toddler, chewing on everything from end tables to window sills. He would chew his shirts and pants. If there were any toys in the house made out of foam, they were always in his mouth and chewed up. If he had nothing else he'd start chewing his hands or biting others. Still to this day, he loves to chew on foam. Bulldozer's OT brought us a chewie necklace that we kept around Bulldozer's waist 99% of the time while he was awake. It looked like an old telephone cord. He loved that chew toy. Bulldozer also has specific preferences in regards to his foods, just like Dinomite, although they are different. Bulldozer loves textured foods and sweets. He enjoys pastas, chicken, bacon, corn on the cob, etc. He loves baked goods of all kinds. Bulldozer won't drink anything but water. The water must be room temperature with no ice. Recently he's also started to enjoy whole milk with chocolate syrup in it as well as hot cocoa. In the classroom we try to find a balance between what Dinomite will eat and what Bulldozer will eat. Unlike Dinomite, Bulldozer becomes VERY distracted by food. He's unable to concentrate on his work and rarely accomplishes anything. However, if I use allergy friendly treats as incentives, I can pretty much get Bulldozer to do anything. Sunshine craves oral stimulation. She loves her vibrating toothbrush and jaw massages. At meal times she prefers very textured foods with spice and varying tastes. Sunshine tends to over stuff, gag, and vomit on a regular basis. It takes a very long time for her to eat her food properly. Shortly after Bulldozer was born, it was discovered he had over 40 food allergies, not just to grains, dairy, eggs, etc., but to vegetables, fruits, meats, legumes, and so much more. He was on a special formula as an infant because he couldn't tolerate breast milk or regular formulas. Finally at age 9 months we were able to try some solids. By trial and error we had to figure out what he could eat. I don't think I'll ever forget those times when he did have severe reactions. It was a Mom's worst nightmare. Eventually things did get better for Bulldozer. He now has about 30 food allergies. He grew out of some, but others have become worse. In the classroom and everywhere else, it's crucial we pay attention to the foods that are present when Bulldozer is around. First and foremost we must keep him safe. Food allergies are not fun. Food triggers a PTSD response for Princess. This goes back to her life before she came to our home, where she experienced significant trauma and neglect. Meal time is very difficult for Princess. More than anything, she tends to refuse food. We've had to work closely with doctors and specialists to make sure we're doing the right things to help her with this process. Thankfully Princess enjoys a variety of foods, except for grains and most legumes. She prefers fruits over any other types of foods. When she's able to work through food related trauma she truly enjoys the process of eating. However, when she can't work through that process, mealtime is her battle ground. I have to be extremely careful with Princess and orally stimulating activities in the classroom. Just this past week, she had a very hard time with our spelling activity that involved cheese letter crackers. Each day she'd choose the activity, but then take over an hour to complete it with significant negative behaviors in the process. Princess is still unable to determine when she's hungry and when she's full. All she knows is that she feels pain related to food or the lack thereof, and can't process what to do about it. It is extremely important that Princess be fed before learning time, to ensure hunger doesn't play a part in her behaviors. This is the case with most kiddos, but with her it's more severe. Princess needs to know that there is food and drink available to her at all times. The fear of not having enough can destroy her in seconds. We always have to make sure there is fruit on hand when she asks for it, along with a water bottle she can carry with her. It took years for her not to scream as we were preparing meals, because she truly believed she would not eat, even though the food was there. Food can not be used as incentives in the classroom for Princess. I must be prepared for the consequences of having food as part of our activities, if I choose to do so. The only reason I have had any success with our In the Kitchen Unit Part I with her, is that she loves to help Mommy prepare food. She's mentioned wanting to be a baker or a chef. She loves the S'mores Trail Mix activity. She also has food related trauma in her past. Most of it is combined with being restrained in some type of container (car seat, swing, etc. ), before she came to our home. She is rarely successful at meal time when sitting in a high chair. Her screaming fits are quite intense combined with the throwing of food, dishes, etc. When working with any type of oral stimuli, Sunshine must have the ability to move around. She needs to feel in control of the situation. Just like Princess, if she sees food being prepared, and can't have a bite, she loses all sense of control and melts down into horrific screaming fits. Strangely, Sunshine loves to incorporate food into her learning time activities, especially if it's a sweet treat. She's just like Bulldozer that way. Food is usually her best incentive, as long as she can move around. How can you meet the varying oral needs of students in your classroom? 1.) 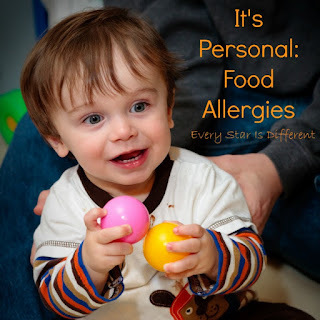 Identify any food allergies and/or intolerances your students might have in order to make sure they are safe. Are there any other medical reasons for your students to be hypersensitive or hypo sensitive to oral stimuli? 2.) 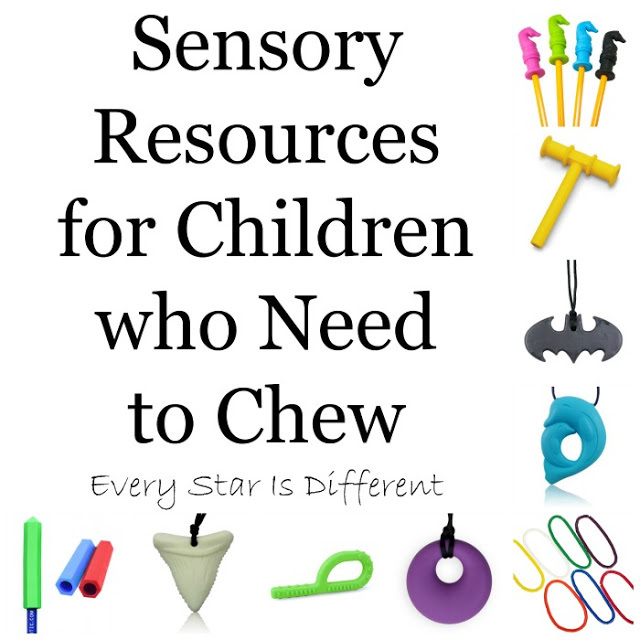 Identify any oral sensory needs your students may have. Are they hypersensitive to oral stimuli or do they crave it? 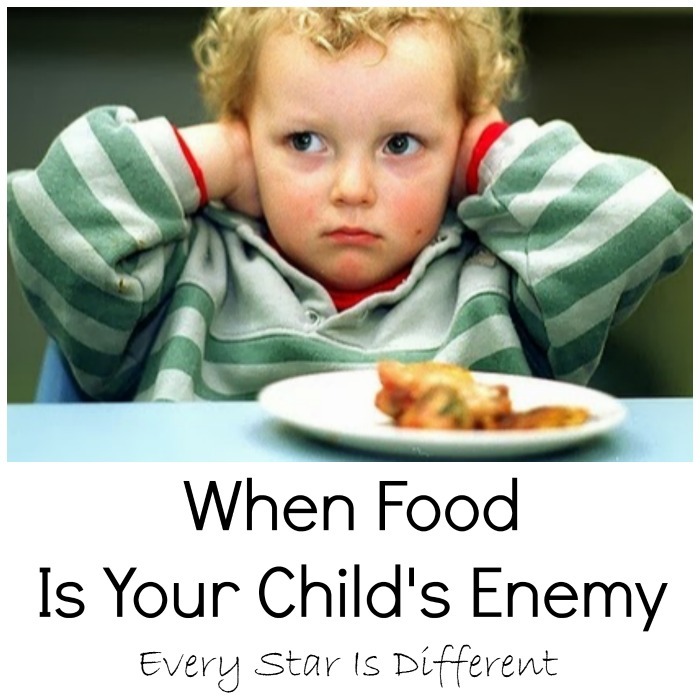 What are you able to do to help a child overcome sensitivities or cope with cravings? 3.) Identify any food related trauma in your students. Work with doctors and specialists (and parents if you work in a school) to determine the best way to help your students with these struggles. 4.) 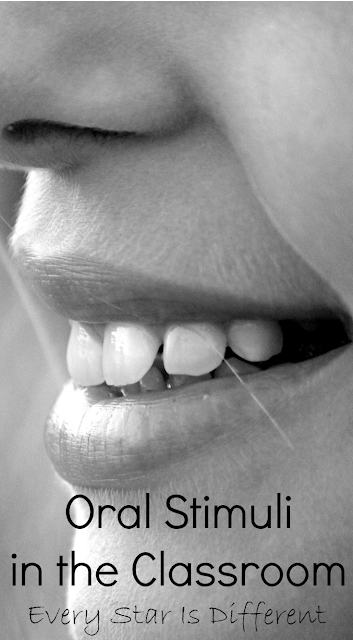 Identify how oral stimuli helps or hinders your students during the learning process. Does oral stimuli improve their ability to concentrate, complete work, and/or lessen anxieties, or is it too much of a distraction, preventing them from completing tasks. Lastly, does your student respond to orally stimulating incentives such as gum, candy, small fruits etc.? Based on your observations,decide how to incorporate oral stimuli into your learning environment. For some, it may be best to not include it. For others it is crucial to a successful learning environment. Remember every child is different. What works for one, may not work for another. I'd love to know what you're doing to meet the oral needs of your students at home and/or at school! Interesting! I know that some of my friends have kids with oral sensory needs. Thanks for breaking all of this down. I appreciate you linking up to The Thoughtful Spot! Hope to see you back again soon!